October 14th witnessed India's largest anti-War demonstration to date... over 70,000 people said "NO" to bombing Afghanistan. Indian activists take part in an anti-war rally in the eastern Indian city of Calcutta. Over 70,000 people staged the peace rally on Sunday in Calcutta in the country's biggest anti-War protest so far. 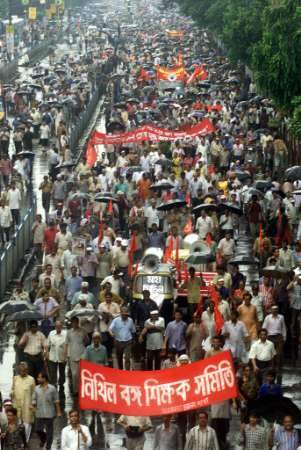 The demonstration in the West Bengal capital, organised by the state's ruling Left Front coalition government, drew members of leftist groups and unions as well as intellectuals and students.